The average heart rate may be used to estimate the calories burned by a person during exercise. A reasonably accurate estimate of calorie expenditure should also consider additional factors such as gender, age and weight. A value for the maximum oxygen volume (VO2 max) will also increase the accuracy of the calorie expenditure estimate. The heart rate can be used to estimate calorie expenditure during exercise. This is because the relationship between heart rate and calorie expenditure is relatively linear so long as the heart rate is between 90 and 150 beats per minute (bpm). This linear relationship allows the average heart rate during an exercise session to estimate calorie expenditure so long as the heart rate stays within the required range. The V02 max is an individual's maximum capacity to transport and use oxygen. An accurate measurement of VO2 max requires the test subject to breathe from a mask while performing incremental exercise until the subject is no longer able to perform. The VO2 max may be measured as an absolute rate of consumption, typically in liters of oxygen per minute. Another common measure of VO2 max is a relative consumption rate such as milliliters of oxygen per kilogram of bodyweight per minute. The VO2 max measurement is typically estimated since an actual measurement of the VO2 max is inconvenient. A variety of methods exist for estimating V02 max, but they all consist of measuring aerobic performance during a maximum effort. One such method is the Cooper test, which has been in wide use since the 1960s. This method provides an approximation of the V02 max from the maximum distance that the subject can run in 12 minutes. The Heart Rate Reserve method takes the resting heart rate into account and can also be used in concert with the VO2 max to monitor exercise intensity. A person wishing to estimate their calorie expenditure rate wears a chest strap that monitors the heart rate. The heart rate monitor must be capable of recording the average heart rate and time of the exercise session. The person performs an aerobic activity such as running, walking or cycling and begins recording the heart rate once it reaches 90 bpm. At this point, nothing else needs to be done except to ensure the heart rate doesn't exceed 150 bpm. The heart rate may continue to be recorded after the exercise session is concluded until the heart rate drops to 90 bpm. The correct formula may be used to estimate calorie expenditure once the required data has been gathered. This consists of the VO2 max (if available), average heart rate, time of exercise, age, weight and gender. 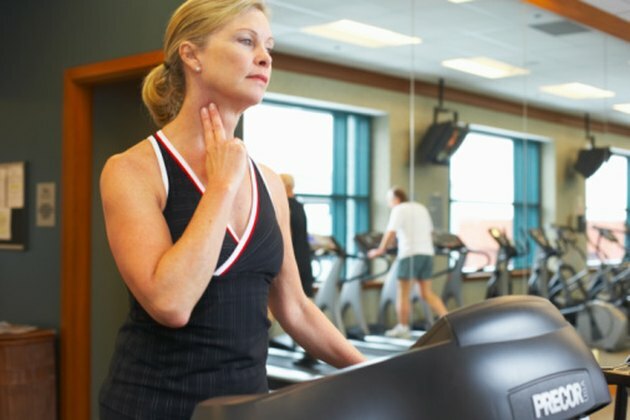 The VO2 max should be evaluated periodically since it can change over time, especially when a person begins exercising regularly.